Neumann GmbH (legal entity almost identical to society with limited responsibility in EU) is almost a century old audio equipment manufacturer. They were the leading manufacturer of broadcast condenser microphones, mixing desks, and cutting lathes (used for phonograph disks). It’s safe to say that someone with that much experience deserves some recognition, which is just one of the many reasons we’ve picked TLM 102 and 103 for our little comparison. Both of these microphones are excellent in terms of quality and value, and we’re here to show you why. The TLM 102 is, basically, the cheaper microphone (of the two) with a high-frequency response, outstanding sensitivity rating, and great build quality. It features an all-metal body which weighs approximately 210 grams (0.46 pounds) – it’s very durable but somewhat smaller than TLM103. Most people point out that TLM 102 is superior to 103 in terms of highs, although it does tend to sound quite flat at times. Overall, this is an excellent boutique-level condenser microphone which will have an amazing value in the hands of a professional who doesn’t want to pay a fortune for 103. Among the most notable specs and features considering TLM 102, we should first mention that this is a microphone with a cardioid polar pattern. It features a frequency response range spanning between 20Hz and 20kHz, a sensitivity rating of -39 decibels, max SPL of 144 decibels, and self-noise of 12 dBA. The TLM 102 is pretty quiet on its own, and sports a rather neutral tone. It’s ideal for live performance and recording in studios, but the reason why professionals like it so much is that it’s as reliable as can be. You’ll get nothing short of perfect-quality consistent tones if you opt for this microphone, and that’s a heavy understatement. Now, if we look at TLM 102 as a standalone microphone, it appears pretty expensive at first. It belongs to the medium bracket of the “boutique” level price point category, but it’s not hard to note that its more expensive counterpart (TLM 103) costs roughly twice as much. The overall value of this microphone is huge, as there are hardly better models within the price range in terms of performance and sound quality. It looks expensive and promises a lot in terms of quality – we’re talking about Neumann’s TLM 103. This microphone is better the more you use it – it peaks at high frequencies, and leaves all the competition in its shade in terms of self-noise, sensitivity, and impedance. This microphone is meant for people who wish only the best gear and who aren’t afraid to pay the part. Just like TLM 102, the TLM 103 is a cardioid microphone with a frequency response range of 20 Hz to 20 kHz. Its sensitivity is somewhat greater (-33 dB as opposed to 102’s -39 dB), and reduced self-noise (7 dBA as opposed to 102’s 12 dBA). This sphere of performance is exactly where TLM 103 shines the brightest – nothing can beat its ground-shattering quality of sound, and you can rest assured that there are but a few microphone models that could dare dance toe to toe with TLM 103. Impeccable highs, pronounced mids, and deeply clear low-freq sounds are the least you should expect. Regardless of whether we intend to compare Neumann’s TLM 103 to any other boutique-level microphone, it’s expensive and there’s no reason to hide it. This microphone does cost a fortune, but it boasts an exquisite value for the money – you’ll know this for sure once you try it out, as it’s among the most uniquely designed cardioid mics ever built. What makes TLM 102 and TLM 103 different? Both of these microphones are fairly sensitive – TLM 102 features the sensitivity rating of -39 dB while TLM 103 has a rating of -33 dB. Now, the difference of six decibels means that TLM 103 is louder, which further means that your amp doesn’t need to suffer from overly high gain and master controls. This round is quite evenly matched, although TLM 103 wins by a straw. The self-noise regards the amount of “interior” sounds a microphone puts through the console – quiet microphones encumber the signal gently and seldom introduce feedback to the mix, whereas microphones with “loud self-noise levels” are easier to handle, but the finishing touches of your mix (if you are recording) will be messier. The self-noise level of TLM 102 is rated at 12 dBA while TLM 103 features a self-noise level of 7dBA. Again, TLM 103 is nearly twice as good in this sphere of performance – you won’t be able to discern the internal sounds it introduces to your signal, whereas the “self-sounds” of TLM 102 are audible, if just barely. Even professionals would have a tough time determining which microphone sounds brighter or more neutral. In fact, both are pretty quiet and perform exceptionally well at all frequency levels. 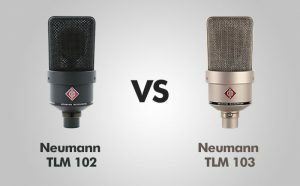 However, TLM102 appears to be a bit darker in comparison to TLM 103 – the mid frequencies of this microphone are just slightly inferior, hence TLM 103 wins another round. The last bout involves the matter of price – even though both TLM 102 and TLM 103 are fairly expensive, TLM 102 appears cheap in comparison to the latter. Both belong to the same price point categories, although in different “divisions”, it’s easy to say that TLM 102 wins this round. Comparing TLM 102 to TLM 103 didn’t fall down easy. At every step we’ve seen the exact same thing we were expecting from the start – TLM 103 is an improved, newer version of its predecessor (TLM 102), so it’s only normal that it’s better in nearly all aspects. The truth is, both of these microphones are great and excel in numerous fields of performance – it’s just that TLM 103 is slightly better, even though it costs nearly twice as much.